Peninsula Automotive hosted the 11th Annual Car Show on Sunday, September 11, 2011. It was such a great day for the many families and friends who joined us for the fun and excitement. Participants enjoyed a record number of beautiful Volkswagens showing for 1st and 2nd place, Peoples’ Choice, and Best of Show awards. VW enthusiasts wandered the swap area and Valve Cover Racers competed for 1st and 2nd place awards in two different age groups, while others enjoyed the annual store discounts going-on inside the showroom. Hope you enjoy the gallery of images below. A record-setting 76 cars participated in the car show this year. Below are this year’s show results. Click on each winner to see a picture of his or her car. We want to thank everyone who came out, participated, and made this the best Car Show yet! Many thanks to all the people and companies who contributed towards making the 11th Annual Car Show a huge success! Your generosity supports the raffle and giveaways enjoyed by VW enthusiasts throughout the day! 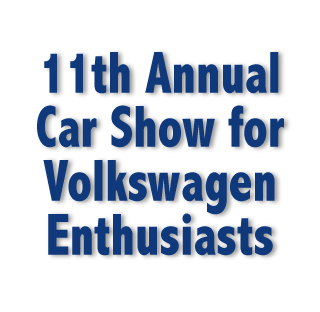 We wish to extend a special thanks to the group of volunteers who help to bring the fun and enjoyment of the Car Show show to other Volkswagen enthusiasts. Once again, your efforts made the 11th Annual Car Show the BEST show ever! A huge thank you to Jim Kikuchi for doing such a great job of capturing our ENGINE BLOW and posting it for all to enjoy!